I'm always on the quest for the best dry shampoo, so I was delighted when Suave sent me this new dry shampoo over Christmas. I liked their original formula, and couldn't wait to see what had changed. 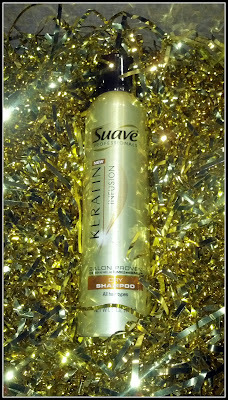 The dry shampoo is just one of the many products featured in Suave's new Keratin Infusion line. Other products include the 30 Day Smoothing Kit, Smoothing Lower Sulfate Shampoo & Conditioner System, Color Care Lower Sulfate Shampoo & Conditioner System, Heat Defense Leave-In Conditioner, and Smooth & Shine Serum. It's found in our hair and keeps it frizz-free. Suave, inspired by expensive keratin treatments, came up with a product line designed to restore keratin. There's no formaldehyde in this line, unlike the expensive alternative. The kit claims to keep hair smooth and sleek for up to 30 days. How is the Keratin Infusion Dry Shampoo Different? This refreshing dry shampoo formulated with KERALOCK™ TECHNOLOGY contains keratin and absorbs oils to help clean your hair so it's refreshed, smooth and manageable between regular washes. It's been salon-tested to be comparable to Bumble & Bumble's white hair powder. Shake can and spray 8-10 inches away from hair, directly onto roots. Fingers will rub in excess powder, and then brush through. Residue....I was a bit apprehensive because my hair usually doesn't bode well with dry shampoos that have white powder. However, by using the product correctly (see my How To here), the powder dispersed well. I didn't see much, if any, powder residue. In fact, when I tried to take a picture of my sprayed hair, it didn't even show up on camera. Scent...The dry shampoo was definitely scented--not a chemical scent, but a strong one. It faded and was pleasant. Results...It worked! While I didn't see my hair smoother (it was on my roots only), it did exactly what it said. Some powder shampoos make my head itch, and this one didn't. Price...around $4, which is about double the price of the regular Suave Dry Shampoo. Since I'm a frugal gal, I would choose this one over the original Suave Dry Shampoo. The formula seemed smoother and I liked how it disappeared, since the "dandruff look" is not hot. If you're out of dry shampoo, maybe give this one a try! Suave Professionals Keratin Infusion Dry Shampoo is in stores now! I tested the dry shampoo after not washing my hair for 5 days. This is how my hair looked after I used it. *Product was sent to me uncompensated by Suave. Opinions are my own. Pics by me, and stats/info provided by Suave. Thank You for sharing!! I use a keratin spray and the regular suave dry shampoo, so I am excited to try the duo!! not washing for 5 days?!?! omg, I would never be able to do that! If it's comparative to B&B, it must be fabulous! Sounds like it's worth checking out - I use dry shampoo pretty regularly. Thanks for sharing your feedback, I'll definitely give it a try. Ahhh you're so gorgeous! So is your hair! My all time favorite dry shampoo is Batiste but the only place I've been able to find it is an hour away from me! So I've been washing my hair way more often, ha. I need to give this a try. Love the festive Christmas lights photo! i love cheap dry shampoo, it's seriously all i use. Oh this looks fantastic! I've been on the search for a good dry shampoo. This might make my shopping list this week! I like their original one (especially the super lemony scent) so I'll definitely try this one! thanks for sharing. I use the original one and love the smell so I might give this one a try if the price is right.